Products of maintenance windows | MAKROWIN s.r.o. Surface treatment on wooden windows makes them resistant against weather conditions and is resistant against UV radiation rays as well. But despite of this fact the regular care for surface is needed and it can be compared to the care about the surface of our car. Time sequence of the treatment depends on the weather conditions. In areas with severe weather conditions and with no protection against the weather influence there is needed a special care and maintenance. We recommend to check regularly the acrylic coating and any damages to repair instantly. Even in the fact that the covering is weather resistant, some regular protection or renovation coverings have to be made. Occasionally we have to check the tightness of seal, this cannot come in touch with strong cleansing or protection agents. The protection covering comes into consideration in case the gloss of the surface has been decreased, but no damage of the surface is visible. To clean the wood only soft and neutral cleansing agents can be used. Aggressive cleansing agents with alcohol content, salmiak and rough agents they can scratch the surface and cannot be used for treatment. Wash down the windows with water after cleansing. For regular cleansing and treatment of windows MAKROWIN we recommend an agent ADLER Fensterpflegeset, which consist from ADLER TOP Cleaner, ADLER TOP Finish and two cleaning pads. 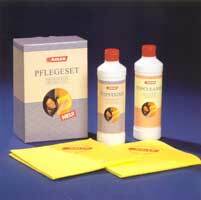 System can be used very simple: dive cleansing pad into ADLER TOP Cleaner and lay it on the surface on. On the dry clean areas lay with second pad agent ADLER TOP Finish. We recommend to repeat this procedure twice a year, from all sides of wooden areas. You can regain a gloss of surface and to prolong its life time. Later varnishing is possible.